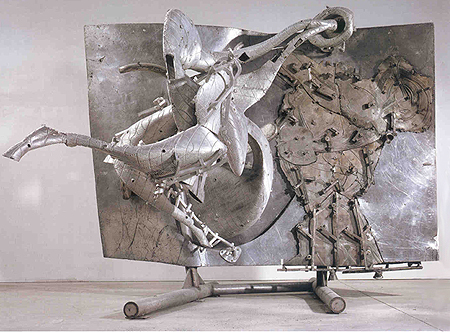 At long last, Frank Stella has satisfied his hunger for greatness. Of course, from the first, Stella has had enormous artworld success. Yet despite this success, Stella has always been controversial, and has had his detractors, especially among advocates of Color Field painting. Not one of the Color Field painters who I knew thought much of his paintings and the critics and collectors have been divided. Clement Greenberg selected Stella for his important “Post Painterly Abstraction” exhibition in 1964, but soon thereafter, lost all interest. Michael Fried, another early advocate, lost interest somewhat later, after failing to turn Stella toward Color Field painting. On the other hand, Former Chief Curator of the M.O.M.A., William Rubin, who at first favored Color Field and Olitski, turned away from them and to Stella already in the 60’s. As for the big collectors of Color Field, David Mirvish has always loved Stella’s work and has even been a patron, while Lewis Cabot and George and Lois de Menil have shown no interest. As for myself, I never got much back from Stella’s paintings. I have stood before them many, many times and given them my full attention. But compared to the best of his contemporaries like Morris Louis, Kenneth Noland, Jules Olitski, Friedel Dzubas, or Helen Frankenther, Stella’s paintings seemed to me tight and mute. In 1977 when I wrote a monograph on Noland, also a geometric painter, Stella seemed to me the perfect foil. Noland used geometry to free himself, to exploit his genius for color. His paintings were strong, clear, buoyant, open, sensuous, and radiant. They were simple yet elusive, literal yet alive. In contrast, Stella’s had no heartbeat. Like Ellsworth Kelly, and the Pop painters, such as Lichtenstein and Rosenquist, Stella’s paintings often seem more like design objects, applied, graphic art, rather than a rich, passionate, personal, statements in paint. Another ready comparison is Mondrian, whose best pictures, despite being much smaller, have far more visual energy, intensity, clarity, and power of conviction than anything by Stella in the 60’s. (Especially if we choose a Mondrian from the late 20’s and 30’s, his most focused period.) Stella’s famous saying “what you see is what you see” confirmed my reactions to his pictures. He here embraces the dead, denying art’s miraculous, life giving spirit, its supreme gift. Stella is exemplary in his titanic ambition, his productivity, and his willingness to pioneer new technology. But, by and large, his paintings have often seemed to illustrate ideas or project an attitude or intellectual position rather than be deeply felt. There are exceptions, and some are better than others, but, considered as expression, his 60’s pictures demonstrate little more than a modest design talent. In the late 1950’s, when Stella first encountered the New York artworld, he was drawn, not to followers of Pollock or the Color Field painters, but to artists who came from commercial art like Robert Rauschenberg and especially Jasper Johns. They were the beginning of what was to become a fashionable taste for an idea driven art, which was identified, by Tom Wolfe in his book the Painted Word. This taste still dominates today. Like the early Pop Artists, Stella had instant success. He created what was essentially a Pop version of high-end abstract painting. Stella did some surprisingly authentic Johns influenced pictures before his first famous series, the “Black Pictures.” These latter have more refinement and warmth but already seem over controlled and pale as expression. I sort of liked his subsequent aluminum series, with its blocky friendliness. Still, less is basically less, as Stella himself proclaimed. The best examples of this kind of “Minimalist” painting are certain pictures by members of the Color Field School like Newman, Rothko, Louis, Noland, Olitski and Poons, in which less is decidedly more. They exalt us, justify us, open us up, not close us down. Stella’s Protractor Series were sympathetic even touching in that they showed an exuberant personality held back by rigidity and a priori thinking. But there was here also a real decorative elan, something which has since served him very well, especially in his scheme for a Toronto theater and other commissions. He has since even showed a vision for architecture. In the early 70’s, as if in penance for the sensual outburst of the Protractors, Stella did a series of pictures, the “Concentric Squares”, which are more rigid, didactic and illustrative than ever. “Diderot”, a huge version of his earlier “Jasper’s Delemma”, may be the non-plus ultra of this group. It has the most commanding scale and power of any of Stella’s paintings. But since he has made it impossible to see both sides of this double, concentric rectangle at the same time, the experience becomes unpleasant even hostile. This reminds me of Serra, king of art as threat. Serra can be great, as in his last two shows at the Gogosian Gallery, where he achieved a stark yet warm elegance full of wonder and awe. On the other hand, when he is merely threatening or illustrating a paraphrasable idea he becomes, for all his swagger, expressively feeble, just like Stella in most of his paintings. But Stella is now showing himself to be a far larger sculptor than Serra. Stella has usually been a leader and very influential. He was a key figure in the beginnings of Minimalism. And throughout the 70’s, he more and more adopted the gestures of Abstract Expressionism, anticipating Neo-Expressionism. At the same time, he underwent the standard Minimalist transformation from painting to sculpture, in his case to high relief. But whatever chance these reliefs had as expression was overpowered and cancelled out by the mechanically “expressionistic” way with which they are painted. The color is confused and the paint handling merely dutiful. The painting acts as an irritating visual static, which keeps the viewer away and frustrated. Psychologically, Stella here hides his spontaneous feelings, which exist in the three dimensional relief, behind the look of passionate painting. Stella’s second, 1987 M.O.M.A. retrospective, first revealed him as a major sculptor. Some large, late, unpainted, aluminum reliefs were far and away the best works in the show. This was again confirmed when I attended the Norton Lectures, later published as ‘Working Space”. Stella is very intelligent and these lectures contain many interesting ideas and perceptions. Yet his central concept is simplistic. Modern painting has reached a dead end in flatness and needs a savior who can create for it a new “Working Space”. It is true that no important painters had appeared in the Abstract Expressionist tradition since the 60’s and this tradition seemed to have atrophied. Stella called it “imageless painting”, in other words, Olitski and his followers. But this was only a temporary situation. In the 80’s, the Abstract Expressionist tradition came roaring back with Neo Expressionism and the New New. In any event, for Stella in the 70’s, painting was being suffocated by flatness. Stella’s Abstract Expressionist reliefs were the answer and he the savior. I love the way he casts himself as a hero deciding the future of western painting. He has a gaudy ego like Courbet or Picasso. But there is an odd disconnect between Stella’s insistence that he is advancing modern painting while everyone could see that his works were better characterized as painted reliefs. It was as if Stella was backing out of painting into sculpture but didn’t want to face it. Caravaggio was only smokescreen. He longed for the spatial freedom which only sculpture can provide. Instead of celebrating painting’s possibilities then, Stella despaired of its limitations. Above all, painting offers an ideal visibility. Since man made walls, he has had a ready made, ideal, parallel surface in his habitual field of vision which cries out to his creative imagination. Note that when paintings are displayed with sculptures, the paintings usually dominate visually and get seen first. Ad Reinhardt once quipped that sculpture was something you trip over trying to see a painting. Painting’s province is this ideal visibility – not its literal flatness. Of course, both painting and relief can occupy this ideal plane. And painting can become very relief-like, most remarkably in the pictures of the Belgian, Bram Bogart or the New New painters, Steven Brent and Bruce Piermarini. 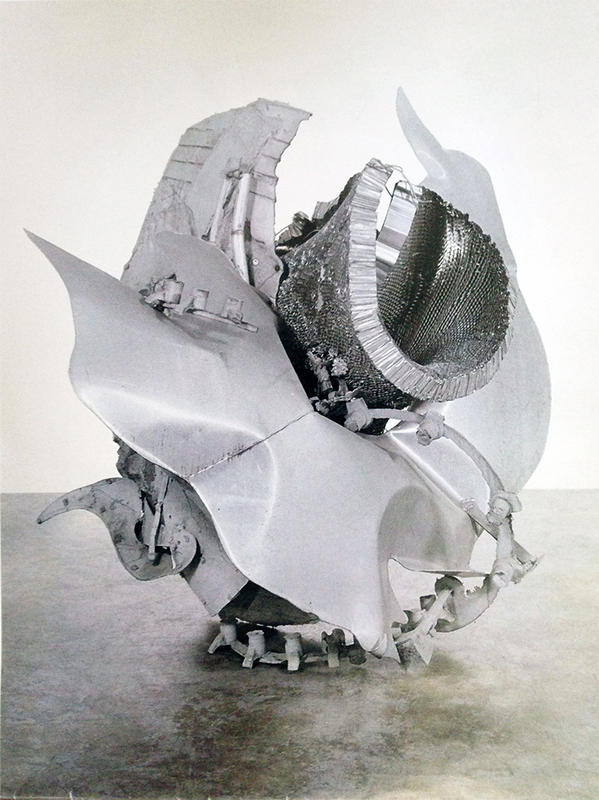 Powerfully relief-like too is that remarkable single work by Jay Defeo, The Rose, today in the Whitney Museum of Art. All these works are grossly sculptural but they still feel like paintings. All show a love of paint and painting, which is what I miss in Stella’s works of this period. These are failed reliefs rather than a new kind of painting, at least for me. Over the past 30+ years, Stella’s work has become ever more three dimensional, but this transition to sculpture has been mostly missteps and misfirings (e.g. “The Cone and Piller” series or the perversely misnamed “Easel Picture” series). But there were also occasional bursts of pure lyrical delight like the Playskool series. Success usually required that the sculptures remain unpainted or be only sparsely painted. Then, in the late 90’s Stella’s sculpture suddenly became much more confident and consistent. In his recent writing too, one can tell that he has finally gained focus and found religion. He has accepted influence from Hans Hofmann, Larry Poons and Jules Olitski. His proclaimed desideratum has gone from “what you see is what you see” to “continuous movement”, “expansiveness”, and “exaltation”. Three of his last, big, New York sculpture shows have been spectacular and the forth, while shown in too small a space and suffering from a somewhat arty finish, also was high level. Completely fearless, Stella’s recent sculpture can be heroic and commanding; it moves from the raw to the refined, the funky to the elegant, the austere to the luscious with breath-taking freedom. If his two-dimensional work still remains lifeless or merely decorative, he can now paint his sculptures with inspired abandon. The arc of Stella’s career is unique and inspiring. He has used fashionable success as a painter to become a sculptor of Whitmanesque largeness, a late blooming Rodin for our time.